rich in history and wonders. 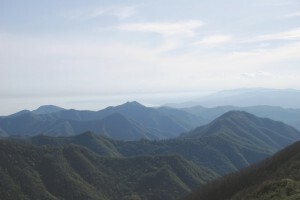 Its Ligurian side is dominated by Mount Antola (1597 m) and its natural park, which also includes villages such as Torriglia, Montebruno and Rovegno. From Torriglia you can reach Pentema’s countrymen’s houses (you can get there by car if you follow the provincial road toward Donetta or on foot – roughly 2 hours’ walk – from Pietra, at via al Prato, when you have just entered Torriglia). They lie on the back of a mountain, locked within a very short space. As you walk past Donetta, the mountain silhouette becomes firmer and more vulgar. 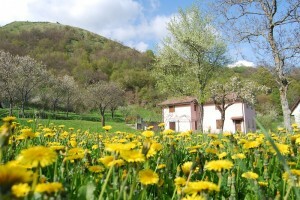 It plunges steeply into the valley and runs as far as the “Taglio di Pentema”. Leave the car in the meaningless square obtained on the side of the road, do not ask yourself too many questions and get to the small path as far as the stone platform which used to be a small chalk statue… Distances bewteen the seaside and the Apennines are cancelled and you can take a joyful, deep breath. like water is pushed into a container. what you are lies there, at the bottom. at Taglio di Pentema I am the world. On the contrary, if from the Donetta junction you keep going along the provincial road you will get to the banks of the Brugneto lake. The massive dam echoes each noise and on the lake surface the breath of that huge stretch of blue water will wrap you up just like a glove covers one’s hand. 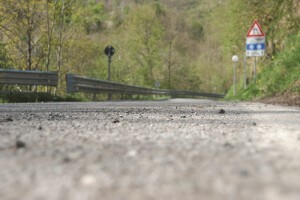 If you carry on toward the Retezzo village, the road will go down to join the state road number 45 at Montebruno – an ancient Roman village – and later on Rovegno. Less than 4 km away from Rovegno, you will find the Pietranera rural oasis, where the wind chases the silence that, like a smiling girl, gets caught by the slits in the houses and the cracks in the walls. As you get past Ottone, the Piacenza province will start, where the road becomes narrower and follows the Trebbia’s sensual silhouette. Following the road overhanging the river that carves the canyons is really unusual for the entire Italian paeninsula. It looks like the huge American rivers.